-1 Egg – * This is optional, you don’t need it, but it will hold everything together even a little better! -Handful of chopped Green Onions if you have them – these were a last minute toss in for me! -Season with Himalayan Pink Salt, Fresh Ground Black Pepper, and a sprinkle of Red Chilli Flakes for added Zing! -Prep all of your ingredients that need to be chopped, diced, and minced! -Combine all ingredients in a bowl with Organic Ground Turkey. Use a fork or hands to mix everything in. I have the most success with my hands, but make sure you wash them well! -Divide into size of pattys you want to serve. I think bite size might be fun for a Superbowl party coming up! 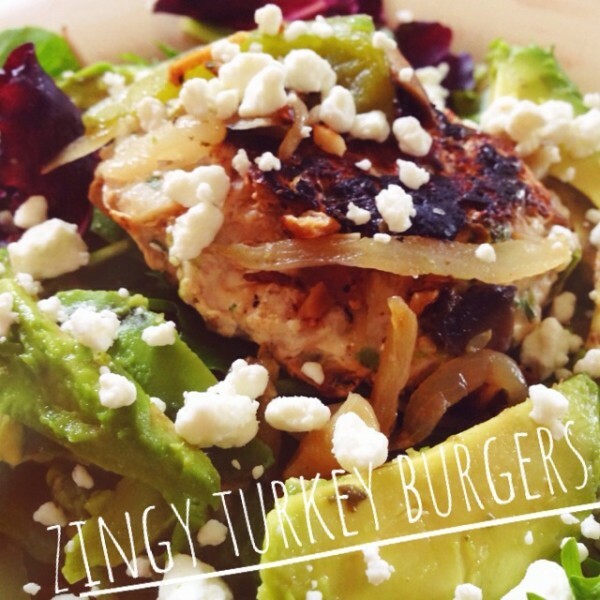 -Stick your Zingy Turkey Burger pattys on the grill or on the stove top to cook until cooked all the way through. If cooking on the stove top, use a little Grapeseed Oil to avoid sticking to the pan. -Place on a Gluten Free Bun, Lettuce Wrap, or my favorite… on top of a bed of lettuce (like a nice spring mix)! -If you’re creating a Salad I placed my Turkey Burger right on top of the bed of greens, added the saute I made (recipe below), sprinkled with goat cheese, added sliced avocado, and a balsamic drizzle on top— soooo delicious! Would be delicious with a lite Honey Mustard as well.